We're off to Germany! We didn't finish all of our book Keeper of the Angels Den during our study of the Netherlands, but figured that it was ok to keep reading it along with Germany since it takes place during WW2. Our week was a little scattered...so most of our time was spent on some of the basic things about Germany. Next week we are doing a fun 'mystery tour' of Germany and I can't wait to share about that with you all! 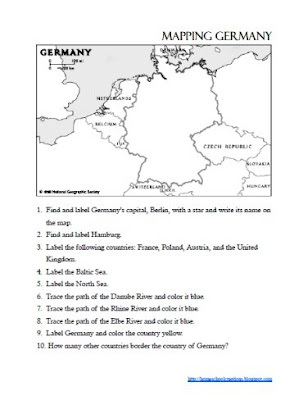 I did put together a few notebooking pages: one is a mapping/labeling activity of Germany that includes labeling some key cities, rivers, seas and identifying the countries that border Germany. 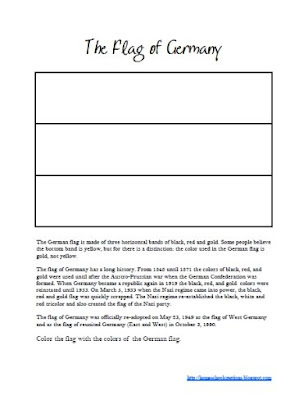 The other is a notebooking and coloring page on the flag of Germany. It also includes a brief history on the German flag. OH! This is SO TERRIFIC! You have INSPIRED ME! I'll be follwoing along closely!